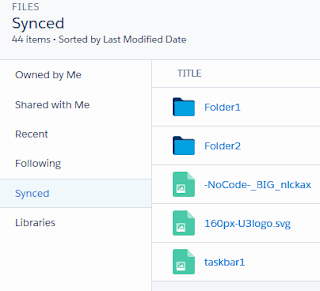 We shared about Files Sync in the previous blog, where we can have two-ways sync from Salesforce with desktop computers, also ability to "create" folder structure from desktop computers which will be synchronized to Salesforce. Next question, once I have my file in Salesforce, who can see my Files? Only me? Or someone else in the company will able to see my files?. Your files in Salesforce can be private to you, privately shared, or visible to your entire company. When Does a File Have This Setting? Your Company All users in your company can find and view this file. 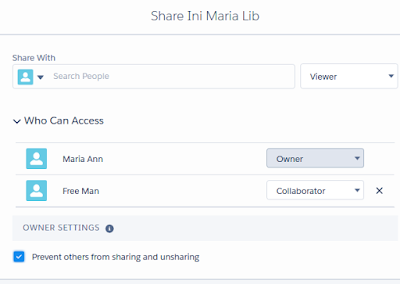 A file is shared with your company when it's posted to a feed that all users can see, a profile, a record, or a public group. When a file sharing is private, only the file owner (the one who upload the file) and users with Modify All Data permission (this includes your System Administrators) will able to see the file, but not for users with View All Data permission. 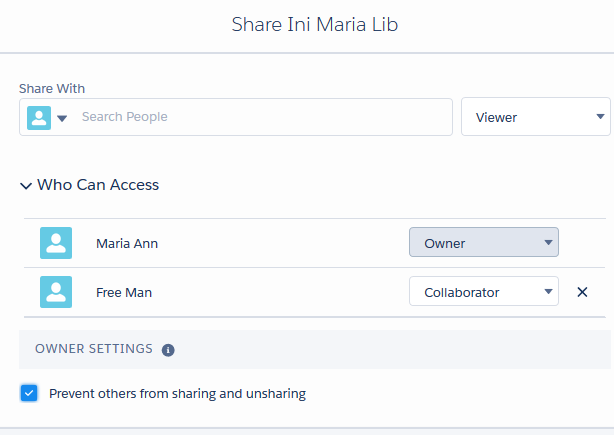 However, for Privately Shared files, users with "View all Data" permission will be able to see it. You have files shared to other user or group, Salesforce offers a function not to allow other users to share it. There is a box in file sharing setting called "Prevent others from sharing and unsharing", tick this box to enable it. Before Winter '18 release, all files on records in Lightning Experience were visible to everyone with access to the record. Winter '18 release introduces "File Privacy on Records" option, when the option selected is "Private on Records" in Lightning Experience and communities, the file will be not visible to all user able to access the record, it will be behavior as Private sharing file. Only file owners and administrators have the power to change the value of File Privacy on Records. 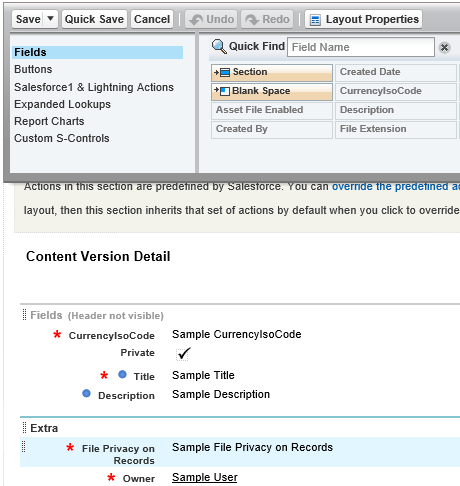 A file marked as private in Lightning Experience is also private in Salesforce Classic. 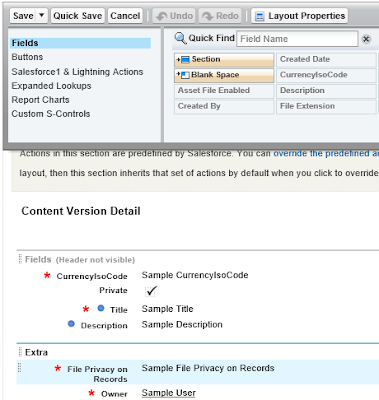 Admin needs to add File Privacy on Records field into Content Version object page layout in the Setup menu. 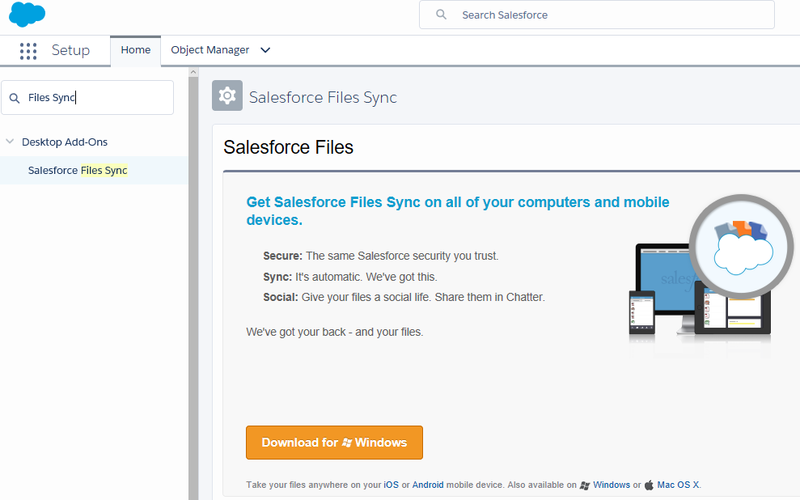 Salesforce Files Sync lets you store your documents in the cloud and access them from any device: your computer, laptop, phone or iPad. You'll never again have to wonder where you left the current version - anywhere you access the file it will be up to date! 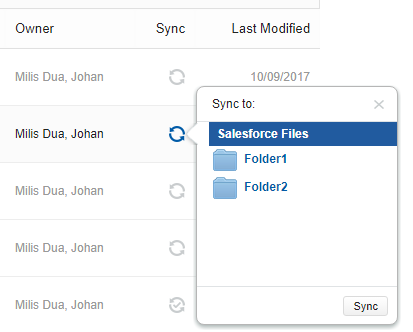 Files Sync is a desktop agent to sync files and folders from your computer with Salesforce Files. This is pretty similar to other providers such as Dropbox, Microsoft OneDrive, Box, and etc, where you can sync files and access it from anywhere, any devices, but also from Salesforce. - You can choose files in Salesforce to be synced, so not all Files will be synced by default. I have a unique case, this company is blocking file hosting service, including their sync agent software, such as Dropbox, OneDrive and etc. However, Salesforce is a legitimate application used by the company, so Files Sync is the only one will work for syncing files. 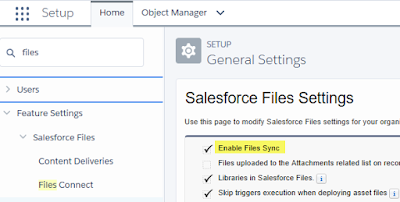 From Setup | Feature Settings | Salesforce Files | General Settings, select Enable Files Sync. Once this enabled, you should see Sync Files permission under Profile or Permission Set. The Sync Files permission need to assign to users, this can be done through Profile or Permission Set. The user needs to install Files Sync agent to their computer. 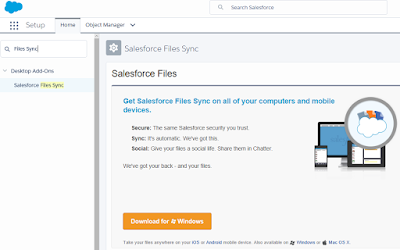 Download the installer from personal settings, enter Files Sync in the Quick Find box, then select Salesforce Files Sync. Available for both Windows and Mac OS X. Follow the installation instructions for your operating system, then log in with your Salesforce credentials. From Setup, enter File Upload and Download Security in the Quick Find box, then select File Upload and Download Security. This is to control how various file types are handled during upload and download. Select Don't allow HTML uploads as attachments or document records" to prevent users from uploading files that can pose a security risk. 1. When the user has Sync Files permission enabled and desktop agent installed and log in, she or he will see additional column Sync in Classic, this is not available yet in Lightning (Summer '17 release). 2. Additional "Synced" menu is added to the menu under Files tab. 3. The user can sync file from Salesforce by clicking sync icon next to the file, this is not available yet in Lightning (Summer '17 release). 4. When sync agent in the desktop is working properly, the icon in taskbar should be the blue-white cloud with checked. If it is in blue-black cloud, something is wrong, either the user does not have permission for Files Sync, or the Org. has not been enabled for Files Sync. Right-click the icon and select "Sync Status..." for more information. 5. 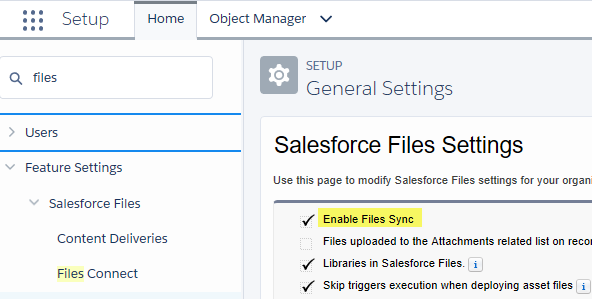 When you overwrite the file in a computer which syncs to Salesforce, the file version history is maintained by Salesforce, you can retrieve the older versions from Content details page. Almost two years ago, we wrote a blog related to Product in Salesforce, continue with another blog to assign Product to Price Book, and on adding Product to Opportunity. In this blog, we will share about step by step to add Product to existing Price Book. Enter all information for product and make sure Active is ticked. Looks for Price Book, then click "Add Standard Price" button. By default, Standard Price Book is selected. In many cases, we do not use Standard Price Book, so you may just select other price books at this window, but you will get error message No standard price defined for this product, this is because we need to have the standard price for the product, even we do not use it. Select Standard Price Book, if you have multi-currency enabled, make sure to select correct Currency, also make sure Active is ticked. From the screenshot in step 2, once Standard Price Book is added, you will see 'Add to Price Book' button. Select the Price Book and Currency. If you need to add into multiple currencies, you need to repeat step 2 above multiple times. Enter the List Price of the Product for that Price Book. If you need to load many products, manual steps as above are not efficient. The solution is the use Data Loader to mass load the products and assigned to the relevant price book. 1. Load products to Product2 object. 2. Assign product to Standard Price Book, get Standard PriceBookId for PricebookEntry object. 3. Assign product to real Price Book, get the real PriceBookId for PricebookEntry object. IdeaExchange: Make Products/Pricebooks Easier to Load!